Need more Easter Eggs? No problem, hens on Anco FIT Poultry are currently producing more eggs for longer than others. This is what recent commercial trials in laying hens, layer breeders and broiler breeders in Brazil and Slovakia are showing. Adding Anco FIT Poultry to the diets of hens post peak egg production has repeatedly shown to improve laying persistence and hence an increase in the number of eggs over time under commercial conditions. On top of that some farms have also reported reduced mortality in hens. Ask your local Anco FIT Poultry distributor for more details and how to apply Anco FIT Poultry to diets of laying hens for greater laying persistence. Want to know what we do with Easter Eggs in Austria? Read the fun facts, traditions and recipe below. Happy Easter to everyone, who celebrates it! The Easter Market at the old Freyung in Vienna, Austria piles up the largest mountain of painted Easter Eggs in Europe. The pile totals around 40 000 eggs every year. The Kramer family in the Austrian state Burgenland is believed to be in the possession of the world’s oldest Easter Egg. In 2019 this hand-scratched Easter Egg is 112 years old. The main Austrian Easter traditions revolve around eggs. Decorating eggshells is a long and popular tradition. The decorated eggshells are then hung up with ribbons onto branches in a vase. Coloured hard-boiled eggs are sold in super markets around Easter time. Here the link to a video showing how 30 000 of these Easter eggs are made per hour in Austria. This normally starts in January every year. But many people still make their own at home by boiling the eggs in food colouring. The company Schrall is based in Würmla, Lower Austria, about 24 minutes by car from the Anco headquarters in Sankt Pölten. 2 players select a coloured hard-boiled egg each. They then knock (peck) the eggs with the tip against each other. The idea is to crack the opponent’s egg while leaving yours unharmed, allowing you to claim the losing egg for yourself. If you have too many Easter Eggs, there is also a solution, how to make further use of leftover eggs. It is a perfect opportunity to prepare an egg spread, which can also make a tasty Easter dish. Savoury bread spreads are very popular in Austria and are easily prepared. This Easter Egg spread is prepared within 10 min. Cut eggs into small cubes. Chop the onion very finely. Mix all the ingredients and season with salt and pepper. The modern egg producer is facing tough challenges ahead. More eggs per laying hen (500 eggs in a single laying cycle of 100 weeks by 2020), whilst reducing the use of antibiotics, improving hen care and welfare, introducing cage-free production and preserving the environment. It requires extra motivation, new and creative thinking to advance egg production. Watch our Monday motivation video for egg producers to boost your motivation and creativity. Milk solid levels, such as protein and fat, are important factors in dairy herd management. Studies have indicated that many herds are producing milk solids below average for their market and their breed, which presents an opportunity to improve milk component production and income from milk sales. There are many factors that can affect milk fat and protein, which can be manipulated for higher levels of milk components. Management of nutrition and feeding practices are most likely to quickly and dramatically alter production of milk fat and protein. Nutrition and feeding management are considered the best solutions to a milk fat or protein problem other than genetics. Milk fat depression can be alleviated within 7 to 21 days by changing the diet. Milk protein changes take at least 3 weeks or longer. Any diet or management factors that affect rumen fermentation can change milk fat and protein levels. Reduction in rumen microbial protein production from nutrition or feeding management imbalances will reduce milk protein by way of less microbial protein for the cow to digest and depress fat by limiting volatile fatty acid (VFA) production in the rumen. Supplementing dairy rations with Anco FIT has been proven in research and field trials to increase milk protein and milk fat yields in dairy cows and thus increase profitability including the cost of the product in the dairy ration. Figure 1 below shows the average improvement in milk fat and protein yields in 8 different dairy trials in 4 different countries (Austria, Germany, USA and Czech Republic). Breeds in the studied herds included Holstein, Simmental, Montbeliarde and Brown Swiss. With current prices (status USDA, 4th January 2018) for milk fat (2.49 $/lb) and milk protein (2.04 $/lb) for US dairy production this improvement in milk components when feeding Anco FIT would mean an increase of $0.60/cow/day in income from milk solids using average performance data of the dairy herds in the 8 trials featured below. Find out more about Anco FIT in the following link: What is Anco FIT? The way animals respond to nutritional stressors affects feed efficiency. Gut agility increases the resistance to stressors and reduces stress reactions in the animal in favour of saving metabolic energy for animal performance and supporting feed efficiency. When challenged with nutritional stress factors, stress reactions such as oxidative stress, reduced gut integrity, inflammation and shifts in gut microflora will be triggered in the animal. This not only reduces growth performance, but also feed efficiency and thus the cost-effectiveness of diets. Feed efficiency is reduced due to energy wasted on stress reactions instead of being used for productive purposes. For instance, under oxidative stress and inflammation, 30% of the performance drop is explained by the catabolism and feed conversion needed to manage inflammation. Ideally the response to nutritional stress factors should consume as little energy as possible or stress reactions should be minimal for better and more consistent feed efficiency. This would be the case if animals were inherently more resistant to nutritional stress factors or were able to adapt to nutritional stressors more energy efficiently. Defense systems in the body that prevent damages caused by reactive oxygen species (ROS) during exposure to infections, inflammation, and stressors are called antioxidant defense systems. Antioxidant defense systems prevent lipid peroxidation by blocking peroxidation chain reactions and acting as ROS scavengers. However, if the endogenous system is overwhelmed by stressors it will trigger oxidative stress. There are ways to enhance the resistance in animals to stressors by nutritional means. For instance, adding anti-oxidant substances to the diet that either scavenge ROS or upregulate and protect endogenous antioxidant defenses has shown to enhance ROS detoxifying capacity of the animal thus reducing oxidative stress in response to stressors. Several bioactive substances derived from herbs and spices have also shown to have high anti-inflammatory properties. Others are known for their ability to help maintain gut integrity and sustain a healthy gut microflora through improved digestion of protein. So, there is scope for nutritional means to optimize the response of animals to nutritional stressors and thus manage the consistency in cost-effectiveness of pig and poultry diets. The gut is particularly responsive to stressors, hence why the emphasis is on the gut when improving the animal’s adaptive response. Gut agility is a new term coined to describe the animal’s ability to adapt to nutritional stressors in a faster and more energy-efficient response than it normally would. Agile nutritional concepts are designed to boost gut agility and empower animals to adapt to a variety of nutritional stress factors, including mycotoxins, making them more robust and energy efficient. They rely on bioactive substances derived from plants that reduce negative stress reactions, such as oxidative stress, inflammation, reduced gut integrity and reduced feed intake generally seen in response to stressors. The animal becomes more robust in the face of dietary challenges, resulting in more consistent high performance and well-being. This again will contribute to consistency in the cost-effectiveness of diets under commercial conditions. Anco FIT was introduced to the US market by ADM last year. US dairy herds, which started to use Anco FIT in their dairy rations are now reporting improvements in butterfat and milk protein yields. These results are in accordance with results from research and field trials carried out with Anco FIT in lactating dairy cows in the US and Germany. On top of that Anco FIT was also seen to reduce somatic cell counts (SCC) in milk. Milk components are a key part of the proﬁtability of the dairy farm. In manufactured products such as cheese and powder, the higher the component percentages, the greater the yield of finished product per given amount of milk. It is the right combination of milk components and milk production that will allow the farm to be more proﬁtable. Production of milk fat and protein can vary a lot from one herd to another. US studies showed that herd average milk protein ranged from 1.57% to 4.66%, with an average of 3.05%. Milk fat ranged from 1.77% to 5.98%, with an average of 3.76% (Penn State Extension 2017). This indicates that many herds are producing components below average for their market and their breed, which presents an opportunity to improve component production and income from milk sales. Users can calculate their current price, project milk price at various levels of fat and protein, evaluate income over feed cost, and calculate total components shipped, providing a complete picture of the impact milk components and milk yield have on the farm’s gross income. Anco FIT is a gut agility activator designed to empower dairy cows to cope with nutritional stress factors in a more efficient way. Anco FIT reduces negative stress reactions such as oxidative stress, inflammation and impairment of rumen fermentation and microbial synthesis in response to nutritional stressors, resulting in better and more consistent milk quality and milk component yields. Consistency in the cost-effectiveness of pig diets can be difficult to control, but determines profitability. Anco FIT focuses on managing gut agility for more reliable returns. With up to 70% of production costs coming from the cost of feed, consistency in the cost-effectiveness of diets is key to profitability. To maximize profit opportunity, producers must be diligent in developing feeding strategies that result in best returns over feed and/or margin over feed and facility costs. However, nutritional stressors in the diet, such as reduced nutrient digestibility, endotoxins, antinutrients and mycotoxins, often throw a spanner in the works of consistency in performance in response to diets. Depending on the increased presence or absence of those stressors the same diet can differ in cost-effectiveness. These stressors are often not easy to control for the nutritionist and are part of the reality that animals are facing in modern production systems. When challenged with nutritional stress factors, stress reactions such as oxidative stress, reduced gut integrity, inflammation, reduced appetite and shifts in gut microflora will be triggered in the pig. This not only reduces growth performance, but also feed efficiency and thus the cost-effectiveness of diets. Feed efficiency is reduced due to energy wasted on stress reactions instead of being used for productive purposes. For instance, under oxidative stress and inflammation, 30% of the performance drop is explained by the catabolism and feed conversion needed to manage inflammation. Oxidative stress is defined as the presence of reactive oxygen species (ROS) in excess of the available antioxidant capacity of animal cells. Oxidative stress is a major factor related to the development of inflammatory diseases. Increases in intestinal permeability raise the possibility of translocation of bacteria and/or their toxins across the more permeable gut barrier. The resulting endotoxemia can trigger disease onset and progression. The increase in translocation of endotoxins across the intestinal barrier can also stimulate immune cells to secrete pro-inflammatory cytokines and prostaglandins like PGE2, resulting in low-grade inflammation, which again can waste metabolic energy. Regardless of the triggering cause, the innate immune and inflammatory response is triggered in the pig to achieve a better ability to deal with infectious and noninfectious stressors. At the same time this response needs to be accurately controlled to avoid tissue damage and waste of metabolic energy. Certain mycotoxins, such as DON (deoxynivalenol) are known to cause the type of stress reactions mentioned above in pigs. DON also has a significant impact on feed intake in pigs, resulting in reduced growth performance. It is globally the most prevalent mycotoxin in feed stuffs and difficult to control. Therefore, it can also play a significant role in the cost-effectiveness of diets. There is scientific evidence suggesting that for genetic selection, improving the ability of pigs to cope with stressors may be a better way of improving pig performance than selecting only for increased growth potential. That means the pig needs to be able to adapt faster and more adequately to dietary changes and stress factors for efficient growth performance. Genetic selection is certainly going to play an important role for advancement in this capability of the pig. Nutritional strategies supporting the speed and efficacy with which the pig adapts to stressors will bring a more immediate competitive advantage in pig production. Most importantly, the ability of the animal to cope with the stressors will also impact the return on investment of diet formulations and profitability of the producer. The gut is particularly responsive to stressors, hence why the emphasis is on the gut when improving the pig’s adaptive response. Gut agility is a new term coined to describe the pig’s ability to adapt to nutritional stressors in a faster and more energy-efficient response than it normally would. Anco FIT is a gut agility activator, designed to manage gut agility by dietary means and is applied as a feed additive to complete feed. Application of Anco FIT to pig diets empowers animals to adapt to nutritional stress factors more efficiently and live up to their performance potential. For the nutritionist, it provides greater control over the cost-effectiveness of diets. 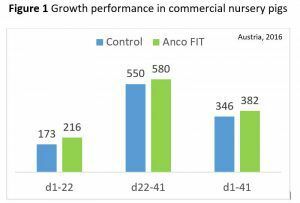 Nursery diets: Anco FIT is recommended in nursery diets to help piglets adapt to feed transitions quicker and support its defense against nutritional stress factors, including mycotoxins. Expected results are improved feed intakes and growth performance during this important developmental stage of the pig. Grow-finish diets: In group housing situations feed intake is generally constrained by physical and behavioural factors and energy available from diets will determine commercial performance particularly in the finishing phase. Anco FIT is applied to grow-finishing pig diets Anco FIT is applied to grow-finish diets to reduce the waste of metabolic energy on stress reactions such as oxidative stress and inflammation. The boost to gut agility also supports efficient nutrient adsorption from the gut. Expected results are greater feed efficiency particularly in the face of nutritional stress factors. Sow lactation diets: Energy demands on modern highly prolific sows are incredibly high during lactation. Efficient dietary energy utilization by the sow during lactation will not only affect litter performance, but also subsequent reproductive performance of the sow. Anco FIT is applied to sow lactation diets to reduce the waste of metabolic energy on stress reactions such as oxidative stress and inflammation. The boost to gut agility also supports efficient nutrient adsorption from the gut. Expected results are high lactation performance and subsequent reproductive capability from improved/more consistent energy efficiency in sows. Anco Animal Nutrition Competence GmbH will be introducing Anco FIT Poultry, a new and unique nutritional concept for the addition to poultry feed at IPPE. Anco® FIT Poultry is a gut agility® activator and designed for competitive poultry production with antibiotic reduction in poultry diets. The unique gut agility concept in Anco FIT empowers animals to adapt to nutritional stress factors efficiently. Scientific trials have proven that Anco FIT Poultry improves metabolic efficiency in broilers and increases the European production efficiency factor (EPEF) in an economical way. Improvements in breast meat yields were also shown. It is impossible to foresee and control all stressors in animal feed. What is important for the profitability of poultry operations is how animals react to nutritional stressors. Feeding Anco FIT Poultry supports animals to react and deal with nutritional stressors more efficiently and be more robust in the face of nutritional challenges. Anco FIT ist ein Gut Agility® Aktivator zur Fütterung bei Hühnern, Rindern und Schweinen und wird besonders in der antibiotikafreien Fütterung in der Tierernährung empfohlen. Die Futtermittellösung basiert auf einem agilen Konzept, was die effiziente Anpassungfähigkeit im Tier gegenüber ernährungsbedingten Stressfaktoren in der Fütterung erhöht. Haben wir Ihr Interesse geweckt? Dann besuchen Sie uns doch auf der EuroTier in der Halle 18, Stand D10.